This is the interview session by TV1 on National 8 O’Clock News. Despite the assumption that today’s students are tech-savvy, many fall short in demonstrating the information literacy skills necessary for success in college and the workforce, a new report says. The report comes from an evaluation of responses from students nationwide to an information-literacy assessment tool developed by the nonprofit ETS. November 28, 2006â€”We often think of today’s students as technology-savvy–and while that might be true, to a certain extent, when it comes to using hardware and software devices, a recently published report shows how little know-how students display when it comes to information literacy, or the ability to use technology to find the information they’re looking for. The report, from Princeton, N.J.-based ETS, found that the majority of high school and college students lack the proper critical thinking skills when it comes to researching online and using sources. The report comes from an evaluation of the responses of 6,300 students from 63 institutions around the country to ETS’s new ICT (Information and Communications Technology) Literacy Assessment. Students were given scenario-based items that were presented to them in 75-minute test environments. These information literacy tests included extracting information from a database, developing a spreadsheet, or composing eMail summaries of research findings. The study found that 52 percent of those tested could correctly judge the objectivity of a web site, and 65 percent could correctly judge that web site’s authoritativeness. But only 40 percent of students entered multiple search terms when researching a topic, and only 44 percent properly identified a statement that captured the demands of the assignment. The results might be surprising to those outside the educational world, who might think that students who grew up with the internet in their homes and schools are naturally adept at navigating their way around the World Wide Web; but to those in education, it is something they have either suspected or known for quite some time. One of the problems, Zaborowski points out, is students’ over-reliance on search engines such as Google when it comes to researching topics. The study found that students typically will type in a search keyword, then simply go to the first search result and use it as an authoritative source. The problem with this approach is that a number of top search results on Google are often slanted or biased. Through a process known as “Googlebombing,” people can alter the top results for a search term. For example, when you type the word “failure” into Google’s search engine, the top result that appears is the White House biographical page for President George Bush. Through this web-based curriculum, Baltimore County has put together a number of research models for elementary, middle, and high school levels. Each research model has a different scenario and task that students must complete. Students are directed to resources the school system has evaluated, which will help them answer key questions. These resources point students in the right direction when it comes to search methods. “We feel that this is an effective strategy in integrating information literacy … within the context of the curriculum,” said Curtis. THANKS for highlighting the use of ICT in two model schools SMK Sri Permata and SMK Dindings (StarEducation, Nov 5). ICT is here to stay. Yet, the poor reinforcement of ICT learning in many urban schools today is both appalling and disturbing. It has been seven years since the implementation of the Education Ministryâ€™s Smart School project, with 4,500 schools equipped with computer labs. Yet many students are not getting the benefit of ICT education in schools. Ironically, many students learn more about the Internet in cybercafÃ©s than in their schools. My son is now in Form Two in an urban school and there is no ICT syllabus in his studies. His school has no computer lab while most of the teachers have school-provided laptops. Very few of the teachers use computer software for teaching, yet many projects and assignments are given to students that require computer applications. Isnâ€™t it likely that students will have to go to cybercafÃ©s to complete their assignments? LEARNING about the English language used in the internet.Then why are our schools under the smart school system not giving students the benefit of ICT knowledge?However, some insight can be gleaned from the model schools. Firstly, the principal must be a far-sighted leader to realise the importance of ICT education. Secondly, computer labs must be made easily accessible to students who should be given free time to log onto the Internet for purposes other than doing school assignment. To create the ICT culture, students must be encouraged to use the computers. On the flip side, teachers must also be given computer software and Internet training to keep abreast with ICT knowledge. Thirdly, the school must have PTA support as well as the benefit of the Education Ministry’s training in handling hardware and software. Only a committed partnership will ensure the success of ICT use in schools. I fully agree with Chua of SMK Sri Permata that the school computer lab is a safer place than the cybercafÃ©. It is a way to help solve social problems among teenagers. Fourthly, use students to take charge of computer labs. This will help reduce the teachersâ€™ workload and make the students feel a sense of achievement. This can be done by setting school rules to guide the students on computer use. School principals should wake up and start to integrate the use of ICT into their school activities for the sake of the students. SEVEN years after the Education Ministry introduced the Smart School computer programme project at 88 schools, a total of 4,495 more are now equipped with computer labs, in line with the ministryâ€™s Making Schools Smart programme. 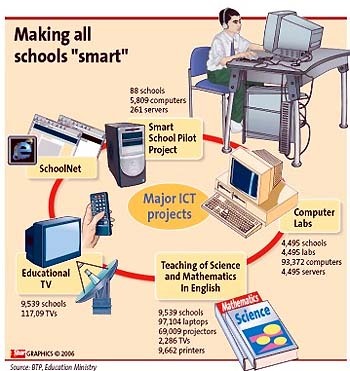 However, according to the ministryâ€™s Educational Technology Division (BTP) director Datuk Yusoff Harun, contrary to common belief, the Malaysian smart school is not one that is solely ICT rich but rather one that optimises ICT and other educational technology to help students learn effectively. Early this year, 10 pilot schools in the Kalabakan area of Sabah were equipped with Internet-ready â€œAccess Centres.â€ to give students and teachers more ICT exposure. The success of this programme has led to the setting up of Access Centres in 74 other primary and secondary schools in the rural areas of Sabah and Johor. The Access Centres are similar to cybercafes but they focus on learning and enabling students to work on their assignments. This is different from the existing computer labs, which are used to conduct lessons for certain subjects and will be housed in a separate room. Recently, Education Minister Datuk Seri Hishammuddin Tun Hussein announced that up to 1,500 schools will be equipped with the Access Centres. The implementation, which costs more than RM70mil, is the first phase of the project and will see the 1,500 schools receiving 15,000 personal computers, 1,500 printers as well as the necessary furniture. Next year, another 1,290 schools will receive 10 computers each. With the Access Centres, the ratio of computers to students would be reduced, allowing students more ICT access. Access Centres could even be opened to the community as its local ICT centre.It is also hoped that the number of students frequenting cybercafes will be reduced when the Internet service in schools functions properly. To assist schools manage their ICT facilities, the ministry is drawing up guidelines. To ensure security, different insurance schemes for the computer labs are being studied. The ministry has also promised that the schools without basic amenities would have power and water supply by 2010, and would have their generator sets upgraded during the interim period. Not for schoolwork only By HARIATI AZIZAN LUIIS is CENTRE of ATTENTION â€“ Male, 18-years-old, from down south, Texas, United States pops up on the big screen in the front of the computer lab of SMK Sri Permata in Petaling Jaya, Selangor. â€œThat is mine,â€ exclaims Amir (not his real name) pointing to the big screen. Chua (right) with her hardworking ICT team (from left) Koh Chin Kiang Ramani Kuppusamy, Abdullah Sani Deraman and Chin Siew Yin. His monitor screen has been flashed on the large screen for all to see but instead of quickly clicking off, he simply continues to browse the other profiles on MySpace. Like most teens around the world, Amir is caught up in the MySpace craze. He spends at least 20 minutes a day visiting the social networking website to see if he has made any new friends. Unlike most teens though, Amir does all this in school. The latest football results pop up on the big screen next which soon morphed into a â€œworldâ€ from the webgame Utopia. It is recess time at Sri Permata and the computer lab at the school is full of Form One and Form Two students checking emails, chatting online, playing games or just surfing the internet. While most schools keep their computer facilities secure under locks, at Sri Permata, the school computer lab is an open avenue for students to hone their information and communication technology (ICT) skills. According to the Education Ministryâ€™s Educational Technology Division (BTP) the effectiveness of the ministryâ€™s programmes in making teachers and students ICT savvy depends not only on how well the school is equipped but also the extent of usage of the infrastructure provided. As reported recently, apart from schools without electricity supply in rural areas, all others have been installed with ICT infrastructure. The usage, however, is still below the ministryâ€™s target. According to World Bank standards, any facility should have 70% utilisation to be effective, says BTP director Datuk Yusoff Harun. He says his division has received reports that many schools restrict computer usage due to various problems such as teacher shortage, lack of technical support and funding for maintenance. They have received reports of schools keeping their labs locked all the time, he adds, and BTPâ€™s job is to investigate and ensure that they provide more access to students and teachers, in line with the ministryâ€™s Making Schools Smart programme. This programme is aimed at creating an ICT culture in school where all students and teachers use ICT in their learning and teaching respectively. â€œWe have been tasked to monitor and collect data of computer usage in schools. Based on the data, we categorise the schools into grades – A to E – depending on the percentage of usage. â€œFor example, to be in Grade A, all teachers in the school need to use the computer in all their lessons while schools that have ICT facilities but are not using it at all (have a 0% usage) will be graded E,â€ he adds. At Sri Permata, the computer lab is a popular hangout. Opened during school hours, recess time is its peak period, and the computer lab is often so full that students have to be turned away. In fact, the computer lab is so popular among students that even students from the morning session are staying back after school to use the computers to finish their homework or surf the Internet. Students are charged a fee of RM1.50 an hour to surf the Internet. To help maintain the computer lab, the school charges students a minimum annual fee of RM70. â€œThe fees are used to pay for software licences, files, printing materials, diskettes, the Internet connection as well as lab maintenance,â€ says Chua Siwe Geck, the teacher in charge of the schoolâ€™s ICT programme Komputer Dalam Pendidikan (KDP). â€œOur students know we are monitoring what they are doing online and that we check on them all the time, so they do not misuse the computer,â€ she says. Using an LCD system, the screens from studentsâ€™ PC are randomly flashed in front of the class for 10 seconds. This, stresses Chua, keeps the students in check. â€œWe donâ€™t want to enforce a schoolwork only rule on the students when they use the computer because they need to take a break from class work sometimes and by using the computer they get to apply their IT skills,â€ adds Chua. Interestingly, Internet games are allowed for students. â€œI think we should not control the child because sometimes we adults also love to play games. â€œThe school enforces certain rules such as no visiting of pornographic or violent websites,â€ says Chua. Students are asked to sign an agreement letter to abide by the rules. â€œItâ€™s like a Surat Akujanji and so far we have not had any problems,â€ she explains. While most schools had to rely on donations from corporations in the IT industry or handouts from the Government, Sri Permata has its proactive Parent-Teacher Association (PTA) to thank for its computer programme. The PTA sponsored RM80,000 to set up the computer lab in 2000. As soon as the computer lab was ready, the school started its computer literacy classes for its Forms One and Two students. Access to Internet has further honed their research, and information management skills. Six years on, the computer programme is running independently. The hardware is upgraded every two years and for security, the computer lab is wired with an alarm. However, says Chua, theft or robbery is the last thing she needs to worry about. She attributes the smooth running of the computer programme to the teachers in her team working in the school computer lab. â€œThere are four teachers and one non-teaching staff. The teachers sacrifice their free time and recess time to make sure the students have the best at the computer lab,â€ she says. There are now 40 PCs but the school hopes to set up a proper cybercafÃ© in the school soon so that students can get more access to the Internet. Now, the computer lab is also used for the schoolâ€™s IT classes and for other subjects. â€œWe have the room, but we need to raise more money to get the room ready,â€ she says. Still, with all the access to Internet in school, Chua admits that students still go out to cybercafes to go online, as not all the students have Internet access at home. â€œIâ€™d say only about 50% of the students have Internet access at home.â€ She adds that she avoids giving them too much work using the computer or Internet because she is afraid they will use that as an excuse to go to the cybercafe. â€œThey will tell their parents that the teacher has given them work and they have to go to the cybercafe to finish it. â€œWe tried to open on weekends but there were many constraints. â€œWe are also afraid that if we open, students may tell parents that they are coming to school but then they go somewhere else,â€ she opines. She believes most parents are not aware of what their children are up to on the net simply because they are not as savvy. â€œSometimes I joke about holding a workshop for parents. You should see how many start panicking â€“ â€˜No! donâ€™t teacher – theyâ€™ll shoutâ€™,â€ she says with a laugh. Chua fully supports the governmentâ€™s plans to curb cybercafes. She says she is aware that sometimes even those who have Internet connection at home prefer to go to cybercafes to get more freedom online, away from their parentsâ€™ eagle eyes. THE first thing that you notice when you walk into a computer lab of SMJK Dindings is the lack of grilles, bolts or chains. The doors are flung wide open and anyone can walk in and out of the computer labs freely. And most progressive of all is â€“ no teacher supervision. SMJK Dindings students also helped build the schoolâ€™s computer labs. â€œI believe that people basically can be trusted and educated. But I also believe that if the punishment is hard, swift and fast when a rule is broken, people will tow the line,â€ says SMJK Dindings principal Tiong Ting Ming. Discipline is the rule at the school and that includes computer usage and Internet etiquette. He says that he begins with instilling discipline in students. Tiong is not one to mince his words and his students know that. Those who are caught visiting violent or pornographic websites are given public caning at the schoolâ€™s assembly. Tiong says at the end of the day it is down to the question of need. â€œStudents know that they will forfeit their right to use the computers if they are caught doing what they are not allowed to in the labs, so they donâ€™t try anything,â€ he adds. Pasted on notice boards all around the school and inside the labs, the rules are few and clear, including no sharing of password or user account and no wastage of ICT resources and no computer games. The open policy at the humble small town school seems to work. At Dindings, students and teachers have easy access to ICT facilities with its flexible opening hours including on weekends or during holidays. Along with the unlimited access to the Internet, they are also provided with printing facilities. There is no limit for computer use in the school but students are expected to log off after an hour if the labs are crowded. SMJK Dindings also has the honour of being the only non-technical secondary school offering the specialised Fundamentals of Programming subject for Sijil Pelajaran Malaysia (SPM). The schoolâ€™s high-tech journey began when Tiong became its principal in 1991. TIONG: I entrust students to manage and maintain the schoolâ€™s ICT facilities. I donâ€™t rely on the teachers. The dropout rate was high and to persuade students to stay in school, Tiong introduced ICT courses. With initiative, enthusiasm and hard work, the semi-government school managed to equip itself with ICT facilities. Tiong’s friends in technology firms donated second-hand equipment, which he and his students repaired during their spare time. The beginning, he admitted, was difficult with a lot of teachers and students resisting change. After raising RM470,000 through various contributions in 1993, the school constructed its new building wired with the latest high-speed Internet connections. Now, there are about 130 computers â€“ in five computer labs, the library, staff room and even in the classrooms. 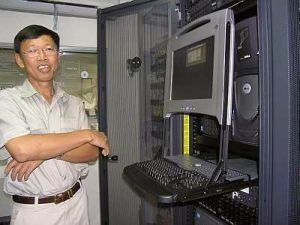 With the expanded infrastructure, Tiong set up a team of computer prefects or cyber brigade. They got the support of IT company Microsoft and the Education Ministry, and students are provided training to repair and maintain ICT facilities. Duties include maintaining and upgrading the ICT facilities as well as repairing the hardware. Form Four cyber brigadiers Yee Yin San and Ho Zi Ling say the training they received has been very useful. â€œSometimes, when our own computers break down we can repair it ourselves,â€ says Yee. Proud of his team of â€œhelpersâ€, Tiong says it all depends on how students are treated. Still, a filtering software is installed to track studentsâ€™ Internet outings. The â€œSquidguardâ€ blocking specific websites deem undesirable. â€œYou can’t be 100% thorough but if students break the rules too often, we’ll catch them. â€œStudents can go on the Internet to search for information on what they like such as music and movie, mobile phones and cars. â€œThey also love to download and share those files; indirectly they are learning to communicate and how to conduct research on the Internet,â€ he says. Chatting is allowed but certain networking websites like MySpace and YOUTube are blocked during the exam period. He adds that although there are educational games, most students play only â€œshootingâ€ games. The printer log files and quota system effectively control printer usage while the centralised virus scanning and spam control filter out the viruses and spam mails. The wired and wireless CCTV system at strategic locations records the people accessing the ICT facilities and help guard the ICT equipment. Tiong admits that even with the availability of computers, some students still visit cybercafes. He feels that stricter regulations on the licensing of cybercafes will not affect his students. â€œIt is not cheap to use Internet and ICT facilities in cybercafÃ©s. In school, the ICT facilities and lessons are readily available, all for only RM12 a month. Lauding the governmentâ€™s move to set up cybercafes in schools, he nonetheless feels that it will depend on how well the schools manage the easy access to ICT facilities. â€œThe easy access to ICT facilities, the Internet proxy and tracking policy, the monitoring of ICT usage and the safety of ICT equipment will determine the failure or the success of the plan to set up the cybercafÃ©s in school. â€œFor my school, I am confident enough to let the students use the ICT faculties without adult supervision during school hours because the monitoring and tracking system is reliable and the rules and regulations effective,â€ he adds.